How to wrap the text around an image and the different wrapping options. This process also works in Word 2013 & 2010. Method 1:Select the image by clicking on it. 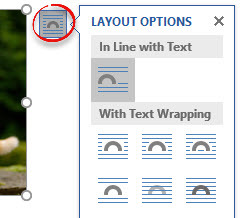 The Picture Tools Context sensitive tab appears, displaying the Format ribbon. Under the Format tab, click Text Wrapping in the Arrange group. Method 2:When the image is selected, a Wrap tool appears. 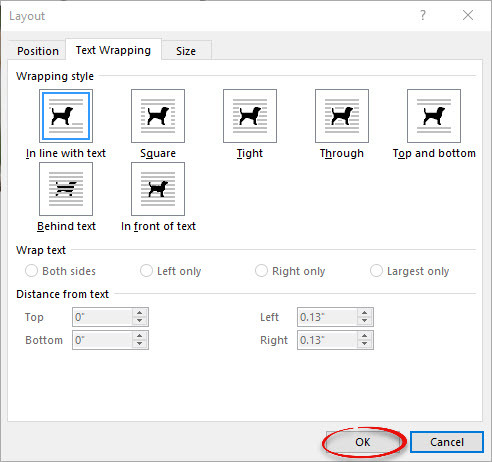 Click the Wrap tool and select a style. Square:Text wraps around the image. the text is allowed to fit close to the boundaries of the image. Behind Text:The image appears behind the text. The image can be dimmed so the text can be read easily. In Front of Text:The image appears in front of the text. Top and Bottom:The text stops above the picture and continues again under the picture. Through:The text stops on the left side of the picture and continues on the right side of the picture. Wrapping style:Same options as the drop down list. Wrap text:Block the text from appearing on a specific side. Distance from text:You can enlarge or reduce the amount of space between the image and the text. For more information on text and image wrapping, watch this Hoonuit video.